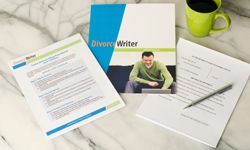 Use DivorceWriter to prepare your own Kansas uncontested divorce forms. You will receive everything you need to get you through the entire process, including step-by-step instructions. If you want to file for divorce in Kansas, only one of the spouses needs to have lived in Kansas for 60 days before filing for divorce. The ground for divorce you will use is incompatibility, which means both spouses agree there is no hope of reconciliation. You start the divorce process by filing the initial divorce documents with the clerk of the District Court in the county where either you or your spouse lives. No need to serve your spouse. Instead, your spouse will sign a Voluntary Entry of Appearance. Your divorce can be finalized in as little as 60 days. If your divorce papers are not accepted by the judge, DivorceWriter offers a full refund. You have qualified to use DivorceWriter to complete your Kansas divorce papers online. Select "Continue" to start the interview.